We own a fifty year old house. It has electric baseboard heaters. Like these. As a heat source, they're impressive. Quiet, fast, and powerful, with room-by-room control of your heat. The problem is that kids can get at this. Sharp scalding-hot metal fins, exposed by a gap that is the ideal size to trap child toys or even hands and feet. This can result in severe burns, requiring emergency room treatment*. Even if the child makes it out unscathed, a toy shoved in that gap could easily catch fire** (and by extension, your home). But the truly scary part: it's a completely unsolved problem. From child safety websites, to handymen we've worked with, and even the websites of companies that make protective covers for baseboards, the recommendation is the same: the only real solution is to rip out your baseboards and install something else. Unfortunately, it seems in most families that having thousands of dollars in spare cash is mutually exclusive with having children, so there needs to be a better way. We installed Baseboarders, paying about $1000 for five covers. 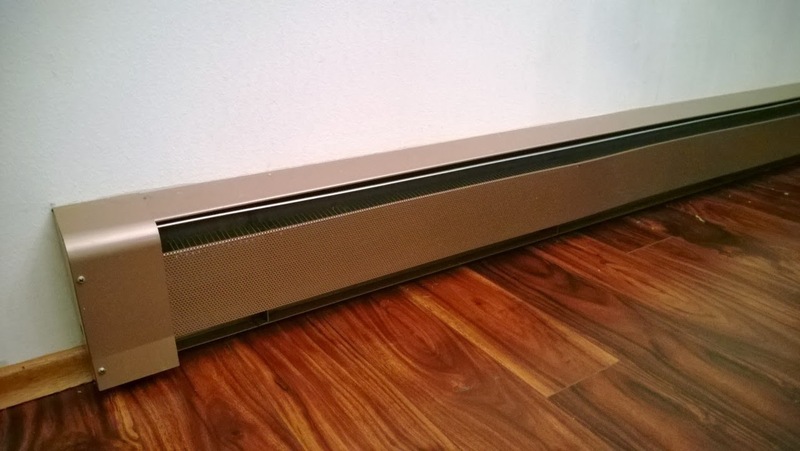 They are steel covers which can, among other things, be mounted over top of an existing baseboard heater. Most importantly, they entirely cover that front opening, preventing anything from getting inside the heater itself. They are installed by screwing mounting brackets above the heater, which leave a small gap to slide the cover down on top of. Endcaps simply slide onto each end. And then you get this. On the plus side, it looks much better! But does it work? The important thing is that the heating element is not directly accessible; in that regard the cover is brilliant. This brilliantly mitigates the risks around the exposed heating element. However that doesn't mean a child will not get burned. The cover is solid steel, and it conducts heat extremely well. Most of it stays cool, but that top surface gets VERY HOT, VERY FAST. While warming up, it's uncomfortable to touch, and at the hottest I've seen, I can't hold my hand to the metal. On the plus side, it also cools down very quickly once the heat is off. The wall mount is at the very top back edge, and there are no additional mounts on the endcaps. This means only gravity and 1.5cm of steel prevents the cover from being torqued from below. 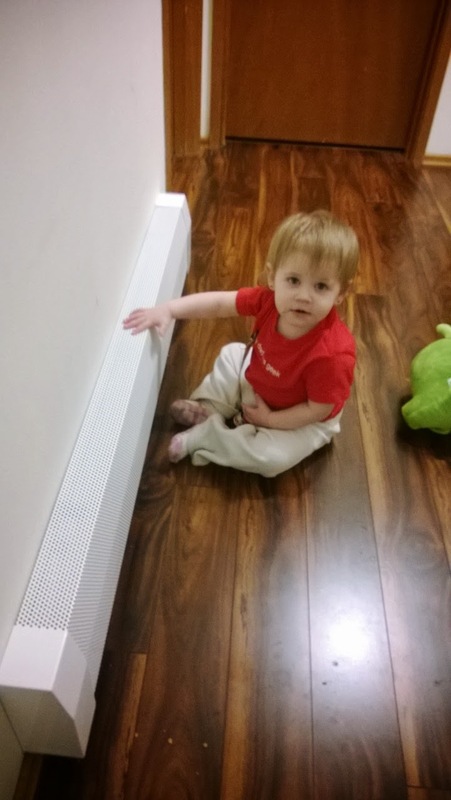 I don't think a toddler could effectively lift the cover enough to get at the heater, but with a bit of motivation might damage the drywall. The endcaps don't actually have anything securing them to the cover except tension from a clip, so with enough wiggling, they could be pulled off entirely. There were a few other metal covers out there, but most were twice the price for a manufacturer with half the reputation, and the same heat problems. The only alternative material was wood, which almost exclusively meant custom fabrication, at prices that would actually make a full heating system replacement look competitive. At which point, I'd just indulge myself. I picked up a fun new toy: a Ryobi laser thermometer. On my latest Baseboarder install, I checked the temperature. So far, the hottest I have measured is 200°F. Is that too hot?﻿ Definitely. WAY too hot. Measuring the safety of a hot surface is a complex scientific process. However, the generally accepted standard seems to be that surfaces hotter than 140°F (60°C) need to be insulated to prevent accidental burns. Above 160°F, you start to risk immediate injuries on contact. We're investigating a few new options now. We are hoping to find some sort of silicone mat which will serve as a protective cover. Will update if we do any new experiments. The company that produces Baseboarders saw my post! 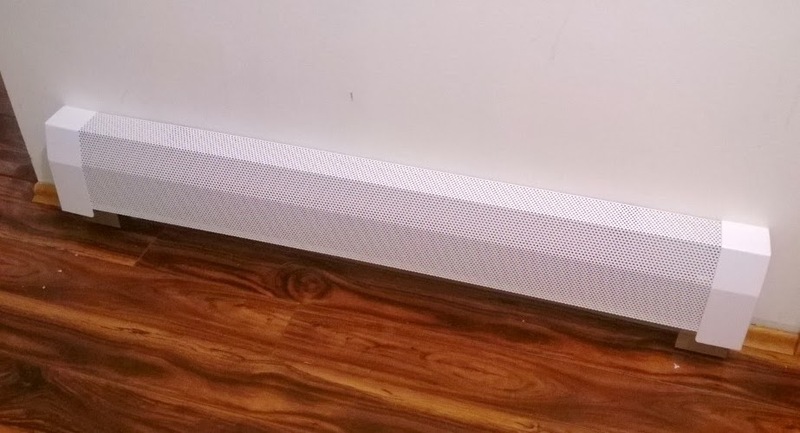 Baseboarders have never been marketed as a product that can bring down the touch temperature of baseboard heaters. They will get just as hot as the original covers. However, Baseboarders feature a clean one piece design, and this produces child safety benefits. 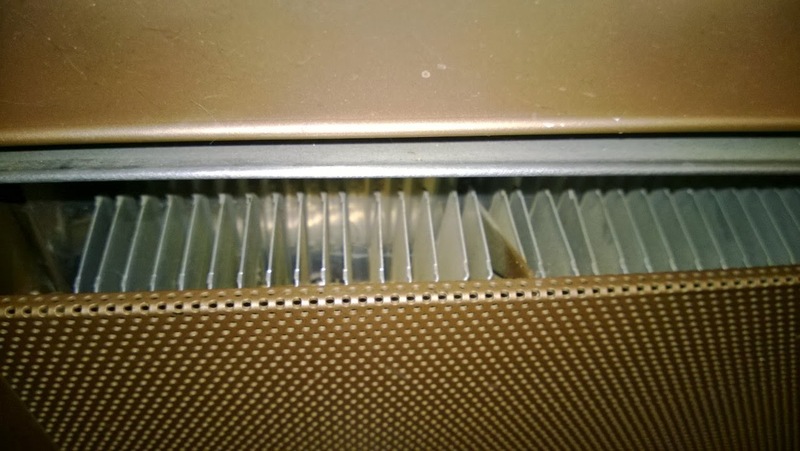 These benefits are strictly limited to the absence of exposed sharp metal edges and a restriction of access to the heating element by way of the hot air out gap that runs the length of the heater. This gap is often used as an opening to push toys into the enclosure and on to the heating element; creating a potential fire hazard.